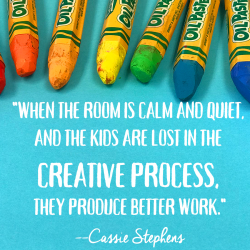 Classroom management plans–in particular schoolwide plans–often fail to take into account the needs of the art room. So how do we deal with that issue? 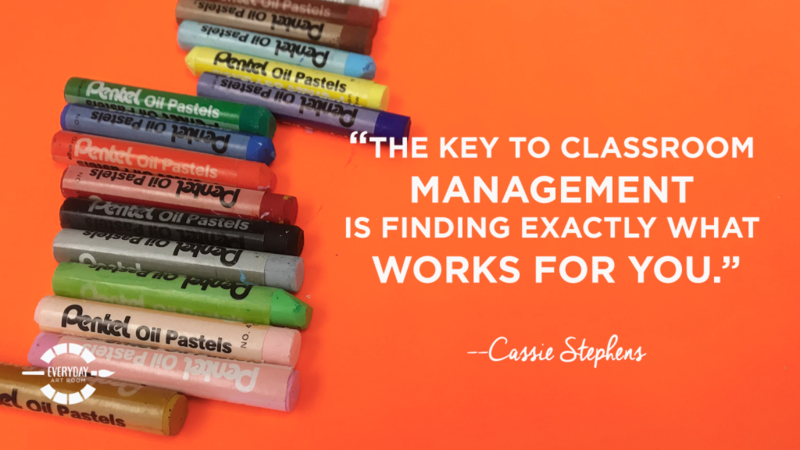 Cassie has some ideas, including her happy/sad board (5:45), how she deals with noise levels (11:30), and how to hold students accountable for individual behaviors (14:30). Full transcript below. Last year, at the beginning of the school year, in fact, it was the last day and like the last hour of our PD right before the kids were to come the next day, our new behavioral plan was introduced to us. Isn’t that swell? A couple of teachers apparently had been through some sort of training. I guess there was an email. Do people really check those in the summer? Emails? No. Not this art teacher anyway, especially if it’s a school email. Anyway, we were introduced to some sort of behavioral plan. I’m not going to tell you the name, but I will say that it started with a P. It ended with an S. There might have been a B and an I somewhere in the middle. Whatever. All I knew is there was a big old BS in there somewhere and I wasn’t digging it, but we were supposed to roll it out. Here’s how it was meant to go, according to my unclear understanding. We were to reward entire classes for good behavior. That sounds lovely in theory, but when you have an entire class in your room where 95% of them are doing swimmingly, but there’s that 5% who just can’t seem to get their life together, and when the teacher asks how were they today, “Did we earn our whatever it was that you’re working toward?” And you have to say no because that 5% ruined it for everybody else. That’s not fair and that’s not cool, and that was the behavior plan that we rolled out last year. Well, what do you know this year? At this year’s faculty meeting, one more time, last hour, last day, we were introduced to yet another twist, we shall, say on this behavior plan. This time it was individual behaviors. Rewarding those kiddos who were doing the right thing, and just not rewarding those as much who can’t seem to we’ll just say get their life together. Aye yai yai. I can’t keep up with what day of the week it is, what classes I’m having, let alone a brand new behavioral school-wide, allegedly, supposedly, behavioral plan. But I have found, I’m going to call it the lazy crazy art teacher’s way to classroom management, for what works for me and just might work for you. I’m Cassie Stephens and this is Everyday Art Room. There’s something that you should know about me and you probably already do because I’ve shared this with you all many times, I am not a consistent person. I don’t exercise consistently. I don’t eat healthy consistently, and my classroom management style is not always consistent. I mean I kick off the beginning of my class the same way with a word of the week and a whoop whoop, and I usually end it with the gong playing and then the kids scooting out of the room. I’m really consistent with being late. I’m pretty sure that’s not a good thing, but classroom management, yeah, that’s not something I’m most super duper swell at. Over the last, whatever, 20 million-ish years it seems, I have found some management things that work really well for me. 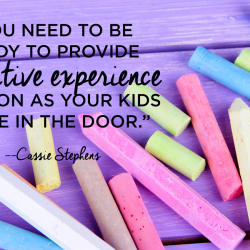 If you are thinking about changing up your classroom management and you are looking for some really easy management tools, something where even an inconsistent art teacher like me, one who’s kind of, I’m not going to lie, a little bit on the lazy side when it comes to classroom management, then have I got … I’m not selling this very well, am I? Have I got the classroom management tools for you. I have three things that I want to share with you today. Three different methods that I use that reward kids on three different levels. One that is a management tool to manage the entire class and encourage positive behavior. Another that builds upon table teamwork, so that every table in your room is working really hard and hopefully diligently, and doing their very best. Lastly, rewarding those individual kiddos, because as much as I shook my head at last year’s discipline plan, I’m kind of digging this idea this year. Rewarding those kids who are doing what’s right, and reminding over and over again, sometimes it seems, those kids who need to get back on track. Let me share with you what I do. For the whole class kind of behavioral management system, I do something that I think I’ve shared on a podcast episode. I’ve definitely talked about it over on my blog, and even created videos on it. It is probably the easiest method I have found to managing a whole class, and my kids really respond well to it. Kindergarten all the way up through fourth grade. Literally, all you need is a dry erase board and a dry erase marker. This is what I call my happy/sad board. On a small dry erase board that I happen to keep on an easel next to my instructional area, I have a little magnet with a happy face and another little magnet that also has a happy face with a line drawn through it. I couldn’t seem to find a magnet with a sad face, so that was my solution. I have the happy face on one side of the dry erase board, the sad face on the other. Whenever my students are doing the right thing, I just go bananas to encourage them to continue to do the right thing by drawing lines under the happy face. If we are forgetting certain rules and routines in my room, for example it’s usually forgetting to raise our hand before speaking out, then I start drawing lines under the sad face. Let me just give you an example. When my third graders walk in the room, and I have doubled up third grade classes, so we’re a big, happy bunch. When we file in the room, as a way to encourage them to do so quickly and quietly, they walk in and they sit down on taped lines that I have on the floor. I will greet them, as I always do, with, “Hello my most amazing artists.” They say, “Hello my most amazing art teacher.” “How are you today?” “Ready to create.” As we’re saying that, they are coming in, filing in, forming the first row first, second row second, third row, you get the idea. If I see the first row come in, sitting so awesomely, I will say that. I’ll say, “First row, you look great.” I take my dry erase marker, draw a line under that happy face. What do you think the rest of the kids are going to do? They see me encouraging one row, that row just got us a line under the happy face. The second row scoots in, they take note of what the first row’s doing, they follow suit. Third row usually does the same. If you have a row or a group of kids that’s coming in not so quietly, then I’ll say, “Oh man, too bad. Some friends are ruining it for us, and sadly I have to draw a line underneath the sad face.” What I like about this is that you’re not calling out individual kids. You’re setting the tone of what you want. What I’ve noticed is the kids who’ve earned the happy faces will sometimes get a little side eye to the friends who’ve gotten them a sad face line. It really encourages positive peer behavior. I use that board when the kids are walking in and when I’m giving instructions. It encourages them not to shout out, to be a good listener, and really, it’s not something I have to keep hearkening back to. Meaning if a kid does shout out, I’ll say, “Oh no, somebody’s talking without raising their hand. What a bummer, I have to draw a line under the sad face.” Again, not calling anybody out to embarrass them, but everybody knows who just got us a line under the sad face. Now, at the end of our class or after the kids go to their seats, do I reference the happy/sad board when it’s now out of sight? No. Sometimes if the teacher will come and get the kids and they’ll ask, “How did we do today?” I’ll look at the happy/sad board and I’ll say, “It looks like we got more happy’s than sad’s, we must have had a really good day.” Honestly, that board is just a way for me to encourage the kids to walk in, sit down, to be attentive to directions, so we can get started. As I said, some classes I won’t even touch that board at all. It’s only when I sense that I’m going to need to have a gentle reminder that we need to be on our best behavior so we can have a great time and get to creating, that I will remind them of the board by drawing lines under it. I use it a lot with my kindergarten, my first grade, sometimes my second grade. It really does work all the way up to fourth. That is the easiest tool I can throw at you right away. You don’t even have to have a dry erase board. You could have a chalkboard, whatever, piece of paper, just use it. The visual is great. That’s kind of like my whole class discipline. Now, when the kids go to their seats, because their seating area is at a distance away from the instructional area, they can no longer really see my happy/sad board. I suppose I could move it. I used to, in the past, put one kid in charge of the happy/sad board, and let them draw lines when they thought we were doing a good job, but I noticed that sometimes that was a bit of a distraction for that student. I’ve just kind of eliminated that. Instead, when the students go to their seats, I switch gears. I go to a more teamwork, table teamwork management routine. Here’s how that works. At every table, and my tables are color coded, I have a caddy, a supply caddy. On the supply caddy, and these are just caddies I picked up at the Dollar Tree, on the supply caddy I have duct tape. On one side, I have red duct tape. On the other side, just a little strip, I have green. On the green duct tape, I have placed five clothespins, I just call them clips to the kids, and I have color coded those, because I’m on a color coding bender, they can just be regular clothespins, and I’ve color coded them to go with the caddy. At the start of every class, all the tables have all five clips on the green, and their goal is to keep them that way. How do they keep them? To make sure that as a team, and there’s four kids normally at every table, as a team they’re working the whole time. That they are making sure to check out where our volume should be. We have three levels of working volume. We have silent, we have whispering, and we have indoor talking voices. Usually, I keep it at a whispering tone, and if I have to remind a table more than once of possibly staying on task or their noise level is getting too loud, if I have to remind them more than once, I’ll ask them to move a clip. Meaning that they have to take one of those clips from the green and put it on the red. If that happens, then at the end of … It does not go back to the green. They can possibly work on earning that point back the following class, but I’m not playing that game where we’re just moving clips back and forth the whole art class. At the end of art class, every table has a laminated, color coded, what do you know, folder. On their folder, I have created a little piece of paper that has, for my 30 minutes classes, 12 squares, for my hour long classes, six squares. At the end of every art class, they have to write their score of how many clips they’ve been able to keep. Their goal being five. If their table writes a five on there, that means they had a super great day as a table. That’s how I manage them to work hard as a table and as a team, to encourage positive behavior amongst each other, and to really push themselves to do their best as a table team. Now, you’re probably thinking, “Why 12 squares on some? Why six on the other?” At the end of six weeks, for my classes that come once a week for an hour, and for my classes that come twice a week, that’s why they have 12, for 30 minutes, then at the end of six weeks, if they have all five and I might fudge it a little bit and give them the exception of one four, then their table gets to have a little celebration. What’s the celebration? They get to use the early finishers stations for the last 15 minutes of art class. Woo hoo. It’s something I already have on hand. Something I know they adore and love, and it’s art related. It’s not just like sitting and eating popcorn and watching a video. That’s how I encourage teamwork at the tables. That does take a little bit of labor on the front end, not going to lie. It took me some work to kind of dream up how this was going to work for me, because I’ve heard about this system working for other teachers. The key is to figuring out, “How is this best going to work for me? How am I going to make this happen?” I know that Susie Art Teacher can make this happen, but she’s a different bird than me. Think about how this can work for you. Again, this one took a little bit of planning on the front end, but so far the kids are really responding well to it, and encouraging each other as a team. Last, but not least, and I feel like this one is super important, and this one, for me, ties in directly with the management plan that my entire school is doing, as having students responsible for their individual behaviors. Ah yes, because you know what? It’s just not fair to those kids who are always on task, always doing the right thing, never say boo to anybody, but somehow they ended up in a class where the kids are doing the wrong thing or making mistakes repetitively. It’s just not fair. I always feel so bad for those kids, that they kind of get the short end of the stick. Why not reward those individual kids, and continue to push those kids who need a little bit more positive encouragement? For that, I have this individual plan. This is new for me this year, and so far I totally dig it. Here is how it works. I’m going to try to paint a little visual in your mind. As I’ve stated earlier, my tables are color coded, and I have four students per table. My tables are rectangular in shape. In the corner of each table, and I’ve covered each table with a piece of paper temporarily, that matches their color table. Red table has a giant red piece of bulletin board paper. Orange table has orange paper on it. On the paper, I’ve written a number in each corner, one through four. If you happen to sit at the orange table in the number one spot, you are Orange Number One. In every class, every different class has a different kid who’s Orange Number One. I have created a clipboard, and I will definitely be sharing this on my blog, in case you’re just like, “Say what now? What?” Definitely hop over there if you need the visual. I have a clipboard and I have eight tables in my room. The reason I have eight tables is because I need that many tables when I have my couple of doubled up classes. I have one for every color in the rainbow, all eight of those tables, and on a clipboard, I have a little matching color rectangle taped to my clipboard. I have a red rectangle, and orange rectangle, yellow, green, light blue, dark blue, purple, and magenta. Those are all eight of my tables, and that’s all eight of the rectangles you would see on my clipboard. Also on my clipboard, if you can imagine one rectangle has four little dots on it. They’re actually like Bingo chips, four Bingo chips in each rectangle. Each one of those Bingo chips signifies the four chairs at the table. On the Bingo chips, using puffy paint, I have just written a one, a two, and a three, and a four. If you’re looking at the orange rectangle, and there’s a number one Bingo chip there, that’s my Orange Number One friend. In that orange rectangle, across the top I have placed Velcro, four dots of Velcro, at the top of the orange rectangle, and another four dots of Velcro at the bottom. When you look at my clipboard, you’ll see all eight of those rectangles, four … I know you’re like, “Say what now?” Four Bingo chips on each rectangle at the top, and another empty dot of Velcro right underneath. The goal for the kids is to keep their chip in its place. Their Bingo chip should stay put. If I have to remind a student not just once, but more than once, “We don’t shout out. We don’t get out of our seat. We don’t yell across the room,” whatever it is that you need to encourage them, if they just aren’t quite getting it, then I take their little Orange Number One chip off and I move it down to that lower Velcro dot. Once their chip has been moved down, then that means that they did not earn, in our school we’re the Johnson Tigers and they’re trying to earn little pads for paw prints, it just means they won’t earn their pad for their paw print for art class. That’s how I have been monitoring my individual behavior. I’ve told the kids that the only time I’ll let their teachers know that they haven’t earned their pad for their paw print is if I send them with a note, or I’ll just shoot the teacher an email and just say, “Hey, Johnny had to move his clip down today, so he didn’t get his pad for his paw print in art.” That way they know that I’m working with their classroom teacher also on their awesome individual behavior. Okay, so like I said, you’re probably thinking, “Oh my God, I’m just going to do the happy/sad board Stephens. You just blew my mind with all this other stuff.” You know what? Classroom management is management. It’s work. It’s something that, I hate to say it, but you’ve got to be consistent with. You can’t be all in one day and just be like, “Eh, we’re not doing that today,” the next, which is, not going to lie, something that I have a bad habit of doing, which explains why later on I get frustrated when my students are not following directions, or kind of just lackadaisical about my management plan, because I’ve been that way as well. It’s something that I’m going to work on, but I really feel like these three different modes of management, whole group, teamwork, and individual, are super important. It’s like life, you know? In life, you want to be successful as a whole group, your team or your family unit, and your individual self, and encouraging that in our kids in something as awesome and fun as art class, what could be better? Like I said, lots of details here. Definitely will share some visuals over on my blog, so as not to blow your mind. Thank you guys so much for letting me share all of that with you today. Tim Bogatz: Hello, this is Tim Bogatz from Art Ed Radio. 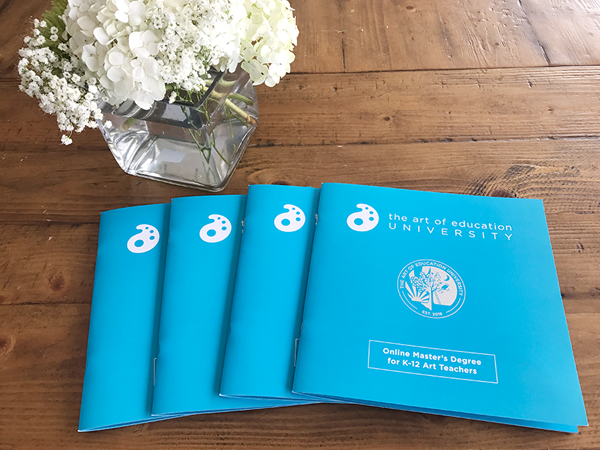 Did you know that you can sign up for a 30 day free trial of Art Ed PRO, the essential subscription service for professional art teachers? PRO members get instant access to a comprehensive on demand library filled with hundreds of expert trainings, hands on tutorials, and rich, printable resources. It is the PD you need when you need it. With topics ranging from assessment, to classroom management, to literacy, and even first day activities. Art Ed PRO has what you need to be the best teacher you can be. Now is the perfect time to get started, as we begin heading back to school. 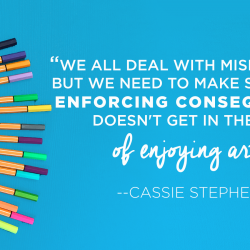 Check it out and start your free trial at the artofed.com/pro. Now, let’s get back to the show, as Cassie opens up the mailbag. Cassie: Hey, let’s take a quick little question from the mailbag. I recently had a very good art teacher buddy reach out to me, letting me know that he was going to be going back into the elementary world, and wondering how I teach vocabulary to my students. I think that, that is such an awesome topic that I will definitely be delving deeper, and I’m pretty sure maybe I’ve done a podcast about it. I don’t know. This is podcast 56. I can’t keep up with all the things that I’ve talked about. I’m like an old lady, I’m going to start repeating myself, but I will tell you this. My number one tool, my art teachering crutch that I use that definitely helps me teach language and vocabulary to my students is call and response. That for sure I have done a podcast about. I just introduced it, in fact, to my kindergartners today. Here’s how you can easily introduce call and response to your students, and you too can become completely hooked. What I do is this, “Boys and girls, I’m going to clear my throat. It’s going to sound like this, eh em. When you hear me do this, eh em, I want you to repeat after me, and I want you to do what I do. Eh em.” Then they all say, “Eh em.” From there, you’ve got them hooked. I usually like to go through my I can statements at the very beginning of that, because you never know when you’re going to be evaluated. I’ll do this, “Eh em.” They’ll do the same, “Today, I can …” See, I got my I cans in there, “Learn about landscape. Landscape has a background, a middle ground, and a foreground.” The more hand motions and hand movements and enunciation that you can do, the better. This is also super great for our ELL or ESL or whatever we’re calling them these days, our English language learners. It’s ELL Stephens, get your life together. There you have it friends. That is just a quick tip on vocabulary, but like I said, I think that’s something that calls for a whole podcast. You know, I’ve tried just about every discipline classroom management plan there is. I think what it really boils down to is, and I’ve been teaching at my school for 15 years, is knowing the kids. Once you’ve been at a school for a while, and you’ve taught the kids for a while, you know them. You know maybe what’s going to excite them, to the point that they can’t control themselves, or what’s going to be a much better incentive for them. Possibly, they’re just a really busy kid, who you need to keep really busy. Meaning, give them a job, give them something to do. Trying to take a kiddo who’s a round peg and, is it round peg/square hole? Square peg, put them in it, there we go. Trying to put that poor little square peg into a round hole just doesn’t always work. These management tools, these classroom management things that I’m sharing with you, tweak them. You know your kids. You know what works for you. If something feels right and if it’s working for you, run with it. If I’m sharing something with you that just, uh huh, feels awkward, weird, “That’s too much for me Stephens,” don’t do it. Think of it as a suggestion and then just drop it like a hot potato. Good luck with all of your classroom management adventures y’all. It’s the one thing that once you lock that down, the rest is cake. Have a great week guys.